We open one gift on Christmas Eve, usually after we get back from church and have a nice dinner. Everyone in the family picks out one small gift for other others to open. Usually it is something small. Then we do our stockings. We usually get lots of mints, lotions, deodorant, and candy in our stockings. Christmas morning is the bigger celebration, but we only open gifts after we've had a good brunch. It is torture for the kids, but it helps the celebration last a little longer. And we open each gift in order from youngest to oldest, one at a time. I have a love hate relationship with my dad giving me chocolate covered Christmas Santas in my stocking. I hate them and he knows it. White Christmas is my top movie, Christmas Story is second, and The Holiday is third! When I was 11 my grandma handmade a dollhouse for me out of yarn and plastic canvas and it was atrocious. I hated it, and I was so offended because I was a middle school girl and life offended me. Ingredients: ▫️2/3 cup dried black elderberries, or 1 1/3 cups fresh or frozen ▫️3½ cups water ▫️1 cup raw honey ▫️1 drop each dōTERRA essential oils: Lemon, Cinnamon, OnGuard, Ginger, Clove, Red Mandarin (or Wild Orange) . . Ingredients above are for one batch. I did a QUADRUPLE recipe because it freezes well and I feel like it’s easier to make it only once in higher quantities! Plus, I love sharing! . . . Directions: 1. Take the freeze-dried elderberries (I got mine from Amazon) and water and bring to a boil. (Photo 1) 2. Reduce heat and simmer (covered) for 1 hour. (Photo 2) 3. Remove from heat and allow to cool slightly (enough so you won’t get burned). 4. Use a potato masher to mash the berries. 5. Strain the mixture through a mesh strainer. Press on the mash to get all the liquid out. 6. Before it cools completely, add the honey and then the essential oils. 7. Divide into jars or freezer safe containers. It freezes well! . . Drink a shot of it straight or add it to water for a tea/juice. This is a great immunity boost! I prefer eggnog with rum and minus the eggnog. I prefer rum. I am a born-and-raised warm white light girl! 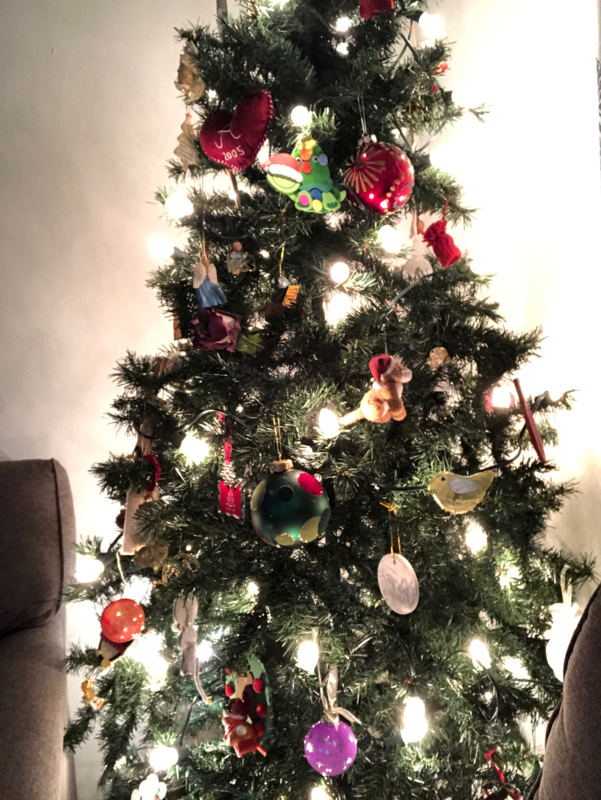 Usually we go for small mini-lights, but this year we opted for C7 size and I'm LOVING them, even on our crazy tree. I loved that my parents would always hide my biggest Christmas gift somewhere in the house. We would all get done unwrapping presents and my parents would act like we were finished. Then as we were throwing out the discarded gift wrap they would suddenly "find" an envelope with my name on it. It would always lead to a scavenger hunt around the house so I could find my final, big gift. Such sweet memories. I would love to get a nice pair of bluetooth headphones and a plant or two. I especially have my eye on a fiddle leaf fig or a monstera plant! Fake. Ain't nobody got time for pine needles. I'm a thought-behind-the-gift girl so I love most things I have received as long as they come from someone I love! I love being with family and trying to take a few extra breaths to remember the reason that we celebrate. I'm a Christian, so Christmas is an extra special time to try and refocus on the work of Jesus Christ. I love getting letters, but I don't send them. I am a horrible person. I don't have anything that I do differently at Christmas versus the rest of the year. I do love putting money in the red buckets though!